Last week, I began a series exploring ‘Wodehouse on Women’ in response to criticism of Indian Summer of an Uncle by Janet Cameron. In Part 1, I opened the case for the defence by demonstrating that Wodehouse did not specifically exclude women as complex characters in his work. One Wodehouse expert has added further evidence, noting that several Wodehouse novels featured well-developed female central characters. The Adventures of Sally (1922) is a good example. Today, I address the next item on the charge sheet. Cameron writes: ‘the male characters (are shown as) victims who support each other as if repelling an unwelcome, alien force’ and that the ‘need to exclude women even overcomes class-consciousness.’ In order to respond to this, a short summary of Indian Summer of an Uncle (1930) is required. Bertie Wooster‘s Uncle George is ‘a prominent London clubman’ of advanced years and even more advanced waistline: ‘tailors measure him just for the sake of the exercise.’ He spends his life gorging at table and boring anyone who’ll listen with complaints about the lining of his stomach or (especially after a few drinks) a barmaid he once loved. At the beginning of the story, Uncle George announces his intention of marrying a young waitress, Miss Rhoda Platt. Bertie thinks Uncle George is behaving like an ‘old fathead’ over a young girl, but he has no particular objection to the girl’s social position. Bertie’s only thought is to escape London before his Aunt Agatha – a notorious snob – hears of it and attempts to involve him in breaking off the affair . He is too late however, and Agatha sends him off, most unwillingly, to offer the girl money to ‘release’ Uncle George. When this scheme fails, Bertie consents to a more subtle plan proposed by Jeeves (whose friend is also in love with the young girl) to introduce Uncle George to the young woman’s Aunt Maudie. Mrs Wilberforce is a large, jovial woman who plans to live with her niece when she is married. Jeeves suggests that Uncle George’s resolve might weaken when he meets this woman, who is definitely ‘of the people’. However, when Bertie orchestrates the meeting, he learns that Aunt Maudie is the barmaid who Uncle George loved and lost in his youth – a fact already known to Jeeves (but withheld from Bertie). An affecting reunion takes place. When Uncle George and Aunt Maudie become engaged, Bertie is (rightly) annoyed to discover that this was Jeeves’ plan all along. But for the reader, the union between Uncle George and Aunt Maudie is a satisfying end. Far from brooding on the engagement, Bertie’s primary concern is to escape the metropolis before his Aunt Agatha finds out. Indian Summer of an Uncle, like most Wodehouse stories, is tangled with plots and sub-plots. The complexity of his plots is one reason why he needed to sketch his characters so lightly and make use of stereotypes. His characters are frequently drawn into league with other characters, not always willingly, with an ambitious and eclectic array of personal motives. Bertie reluctantly colludes with Aunt Agatha to undermine Uncle George – Aunt Agatha’s plan to bribe Rhoda Platt to ‘release’ Uncle George (without his knowledge) parodies popular romantic fiction of the era. It would have been unpleasant for Miss Platt, but she would at least have some choice in the matter -unlike Uncle George. Bertie and Jeeves work in league to end Uncle George’s engagement – While they collude to end Uncle George’s attachment, theirs is not an open and honest partnership. Jeeves hides critical facts from Bertie when he proposes the scheme that will reunite Uncle George with his old flame, Mrs Wilberforce. Bertie and Jeeves unite to escape Aunt Agatha – They conspire to leave town as quickly as possible, before Bertie is asked to intervene in Uncle George’s new engagement. The charge of men ‘working in league’ is therefore partly correct, but most of the collusion in this story occurs at the expense of besotted Uncle George. But there is never a suggestion that Bertie and Jeeves are acting to save George from the clutches of a female or the state of marriage on principle. For that particular storyline, we must turn to Bachelors Anonymous. 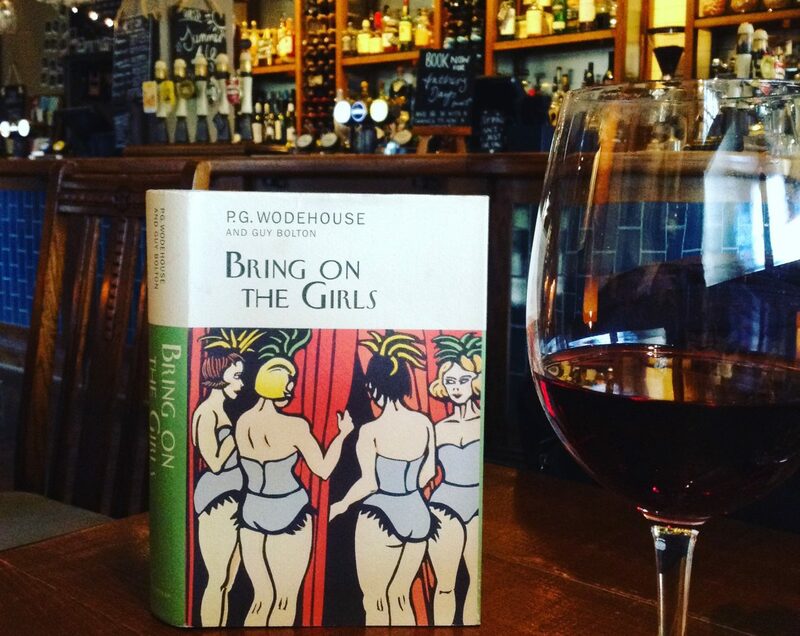 Wodehouse’s misogynist-bachelors are just as ridiculous as the other extremists in his wide cast of characters that includes amateur dictators, snobbish peers, communists, business executives, golfers, Bishop, serious poets – not forgetting the gang of Aunts. By the end of Bachelors Anonymous, his chief Bachelor has seen the light, and espouses just as fanatically on the joys of marriage. Elsewhere in the world of Wodehouse, men and women can frequently be found plotting and scheming together in harmony, thwarting the machinations of appalling villains of both sexes. In Piccadilly Jim (1917), Jimmy Crocker and Ann Chester conspire to kidnap the revolting Ogden Ford. In Leave it Psmith (1923) Psmith unites with Eve Halliday to outwit Rupert Baxter (and a cunning male-female crime duo) to steal Lady Constance’s necklace. It is true that Wodehouse’s men often collude against women, but the reasons are usually complex and plot driven. There are men who are portrayed as victims of women, and in the Jeeves stories the need to ‘save’ chums from marriage (to particular females) is a recurring plot device. But Bertie also helps friends – male and female – towards marriage – and is supportive of his female friends and relatives. As someone who has read Wodehouse widely, I feel qualified to say there is no pattern of male characters specifically excluding and working against females. I feel satisfied that we can dismiss this second charge. What ho! I’ve just discovered your blog and love it! Full of lovely touches (not least of all the “Egg, Bean & Crumpet counter”!) I’ve added a link to this site from my own humble book blog (http://novelreading.wordpress.com). Keep up the good work, Tom. Gosh, Tom. This is exceptionally kind of you – you’ve quite made my day. I am sure you’d enjoy Wodehouse too. I’ve been discovering your blog and I love quite a few of your Top 50. You have excellent taste. An interesting point about Bertie being the next Lord Yaxley. It makes sense, although it is never mentioned to my knowledge. As Bertie already seems to have a goodish pile, it doesn’t seem to be a critical issue to him, but people like Jeeves and Aunt Agatha would certainly be mindful of it. So pleased to have you drop by. I have been doing some exploring around the UK this summer and haven’t had much opportunity to update the page, but I have more things to add soon. OMG, you are so right. It’s Jeeves who would want Bertie to be titled, not Bertie. That bally devious rascal. And have fun on your explorations, old fruit. Looking forward to the updates. I dare say Bertie would cope with the title without complaint, but the pressure to marry a female of his Aunt’s choosing would be unbearable. Also, I wonder if the Glossops, the Wickhams, the Stokers and the Bassetts would have been so quick to look upon him with jaundiced eyes had been the obvious heir apparent. Good points all. Though most of the paters involved are pretty set in their enmity and may mistrust him title or no. Very soundly reasoned. I find it extremely tiresome that many people simply can’t see past the fact that it’s (mostly) set amongst the upper classes: all objectivity goes out of the window, even amongst academics who really should know better. People, indeed! Awfully glad to meet a like-minded soul.